Find the App Store icon and click on it. I posted a link to this article on Social Media Examiner on my Facebook page. But I have learned that if I GET it once at least 3 other people are wondering the same thing. 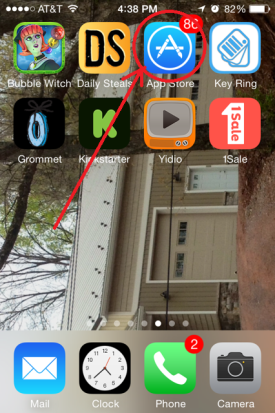 Find the App Store icon and click on it. Looks like a big A and I circled it in the screen shot at the right. Please don’t hate me because I have 86 apps to be updated. (That’s what that little 86 means in the red circle) There are excuses and reasons.. but please don’t ask about them. On the next screen, click on the UPDATE button with the arrow that’s circled in the lower right of this screen (below). 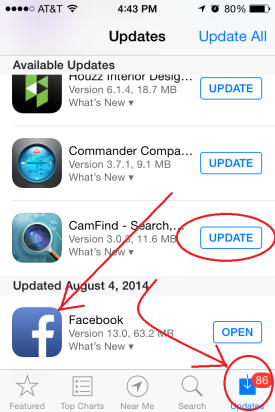 Then scroll down til you find an app you want to update. I already updated my FaceBook app. (na na na) So the button at the right says OPEN. Click that and then wait…. a while. When the button says OPEN, you’re good to go.